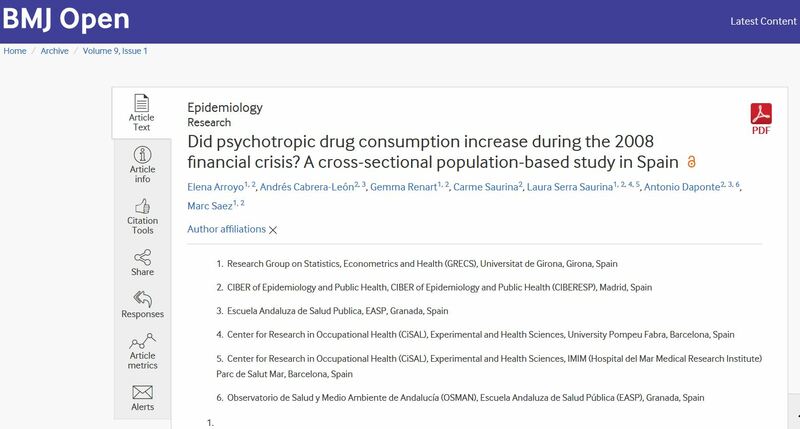 Objectives and setting Although psychotropic drugs are used to treat mental health disorders, little evidence analyses the effects the 2008 economic downturn had on psychotropic drug consumption in the case of Spain. We analyse these effects, considering both gender and employment situation. Participants We used the microdata from the face-to-face cross-sectional population-based Spanish National Health Survey for two periods: 2006–2007 (n=28 954) and 2011–2012 (n=20 509). Our samples included adults (>15 years old). Methods The response variables are consumption (or not) of antidepressants or sedatives and the explanatory variables are the year of the survey, gender and employment status. Covariates are mental health problems, mental health index General Health Questionnaire (GHQ-12) and self-reported health outcome variables such as self-rated health, chronic diseases, smoking behaviour, sleeping hours, body mass index, physical activity in the workplace, medical visits during the past year, age, region of residence (autonomous communities), educational level, marital status and social class of the reference person. Finally, we include interactions between time period, gender and employment status. We specify random effects logistic regressions and use Bayesian methods for the inference. Results The economic crisis did not significantly change the probability of taking antidepressant drugs (OR=0.56, 95% CI 0.18 to 2.56) nor sedatives (OR=1.21, 95% CI 0.26 to 5.49). In general, the probability of consuming antidepressants among men and women decreases, but there are differences depending on employment status. The probability of consuming sedatives also depends on the employment status. Conclusions While the year of the financial crisis is not associated with the consumption of antidepressants nor sedatives, it has widened the gap in consumption differences between men and women. Although antidepressant use dropped, the difference in consumption levels between men and women grew significantly among the retired, and in the case of sedatives, risk of women taking sedatives increased in all groups except students.